We wanted to thank you for your excellent product and fantastic customer service. As you know, we ordered the wrong size Dry Pro cast cover. We were scheduled to depart on our vacation the next morning. You sent the correct Dry Pro cast cover to our hotel, overnight. We received the package when we arrived and it was the perfect fit! 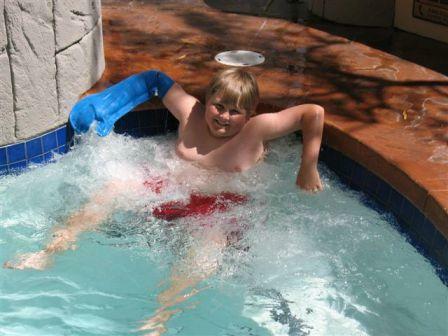 This product really does work, my son’s cast stayed dry and you really did save our vacation. As we were sitting in the doctor’s office, the doctor told Trey that it was very important to keep the cast dry. As he knew we had planned our vacation during the time he would have his cast on, tears fell from his eyes. We searched the internet for a product and found your web site. We were hesitant and not sure if the cover would really work. After spending three days in and out of the water – body surfing – not a drop of water fell on his cast. We would recommend this product as it really does work. Thanks again and we sincerely appreciate your customer service. PS…. as promised, the cast cover that we measured wrong is on it’s way back. Thanks again.